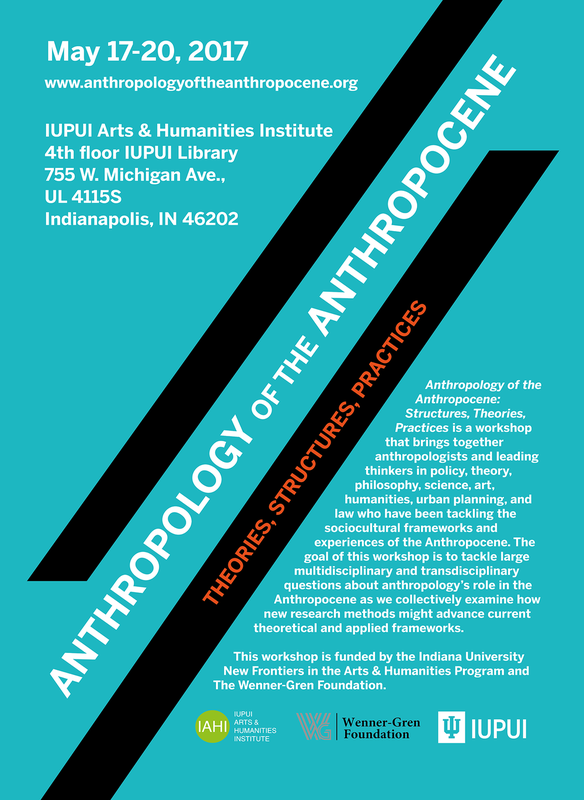 We seek applications from scholars from across the disciplines (including PhD candidates) to participate in the workshop Anthropology of the Anthropocene: Structures, Theories, Practices, which will take place at the IUPUI Arts and Humanities Institute (IAHI) on May 17-20, 2017. This workshop is supported by the Wenner-Gren Foundation and Indiana University’s New Frontiers in the Arts and Humanities grant program. We will also host two evening receptions (Wednesday and Friday) and one participant dinner (Thursday). Anthropology of the Anthropocene: Structures, Theories, Practices is designed to bring together anthropologists who have been tackling the sociocultural frameworks and experiences of the Anthropocene and to place them in conversation with leading thinkers in policy, theory, philosophy, science, art, humanities, urban planning, and law. The goal is to address large multidisciplinary and transdisciplinary questions about anthropology’s role in the Anthropocene and to collectively examine how new research methods might advance current theoretical and applied frameworks. The following are core-framing questions for the workshop: (1) In what ways are anthropological methods, theories, and practices responsive to the Anthropocene? ; (2) How do we bridge disciplinary boundaries to advance critical and timely sociocultural research on changing earth systems and the human experience? ; (3) How are we preparing the next generation of researchers with the right tools, frameworks, and language to design relevant ethnographies? ; and (4) What should a publicly engaged Anthropology of the Anthropocene look like? This workshop will result in several outputs, most notably an edited volume. We encourage participants from all fields, levels of expertise, and geographical regions to apply. Successful applicants will be notified on or before March 15, 2017 so that we can travel arrangements.